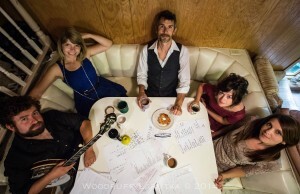 Rockygrass’ Best New Band, The Railsplitters have an adventurous spirit that breaks the traditions of the bluegrass genre with pop-influenced numbers and earthy melodies. Join us at Baur’s Listening Lounge for a bluegrass Saturday night on March 19. Fresh off the success of their first album in 2013, The Railsplitters got busy touring the US, meeting wider audiences, and of course, spending hours in the tourvan. As you can imagine from five members traveling across the United States, the musical array pouring out of the van onto the open highway was wildly eclectic, crossing over genre and time. From boundary breaking trip hop and electronica groups like Gorrilaz and Thievery Corporation, to more direct influences like The Infamous Stringdusters and Lake Street Dive, the musical potpourri heard in their time on the road eventually began to seep into the band’s own music. With their 2015 album, The Faster it Goes, they’re using these new sounds to break the bonds of bluegrass and unleash tradition. Lauren Stovall and the rest of the ‘Splitters suggest that using your roots to evolve is really at the heart of the genre as, “Bill Monroe himself was an innovator.” With their finger on the pulse, The Railsplitters are pushing the genre forward, carrying in the tradition of breaking boundaries with their innovative sound. The Railsplitters’ secret weapon is twofold: first, the innovative imagination of banjo player Dusty Rider’s songwriting, who writes with the full band in mind, imagining an entire song in his head before it’s even heard it out loud. Second, the powerfully distinct vocals of Lauren Stovall whose voice is as clean as Emmylou, as cutting as Allison Krauss, and carrying some of the attitude of Dolly herself. Lauren’s vocal lines fill The Railsplitters’ sound with something distinct and undeniable. In addition, part of The Railsplitters new color is brought on by the band’s newest member Christine King whose superb fiddling adds a driving force to the band’s sound. With masterfully executed mandolin and banjo by Peter Sharpe and Dusty Rider and well supported by upright bassist Leslie Ziegler innovative style, The Faster It Goes testifies to The Railsplitters’ multipolar and collaborative songwriting, giving voice to the impressive talents of its members and a cohesive character to the sound. They operate with the instrumentation of a bluegrass band, but The Railsplitters are making music totally unlimited by tradition. This is music for the open road, the open dance floor, and open ears–music of the American West, made for all. Come down to Baur’s and experience instrumental and vocal harmony with Colorado’s own bluegrass sensation, The Railsplitters.